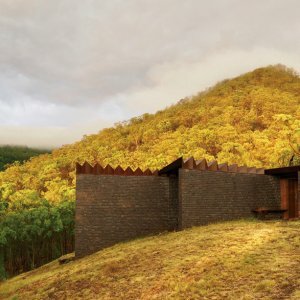 Winner of the international Architectural Masterprize for residential architecture, Bellbird Retreat is a weekend escape in a stunning rural setting. 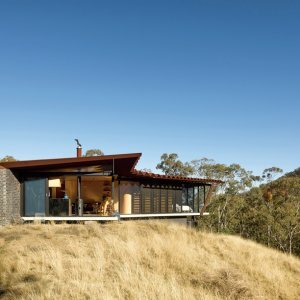 Designed by architect Brian Steendyk, Bellbird Retreat’s win was a brilliant end to a journey which began in 2011. “It was the perfect culmination of years of research and hard graft by our great team to wrangle this little gem from dream into reality,” Brian said. Innovation and bespoke architectural elements feature throughout the home. 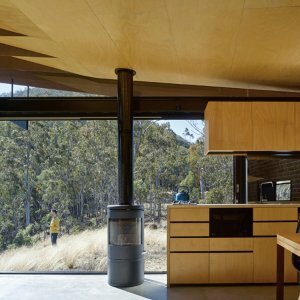 Located in a bushland reserve near Queen Mary Falls on the edge of the Great Dividing Range near Killarney, the dwelling maintains a dialogue between manmade and natural environments. At times, function dictated form with pleasing results, according to Steendyk. The non-combustible weathering steel roof design is one such instance of this. 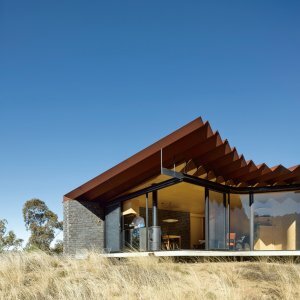 The site is susceptible to bushfires, so there was a desire to include broad eaves that would remain unaffected by fire embers and offer protection from the harsh Australian sun. 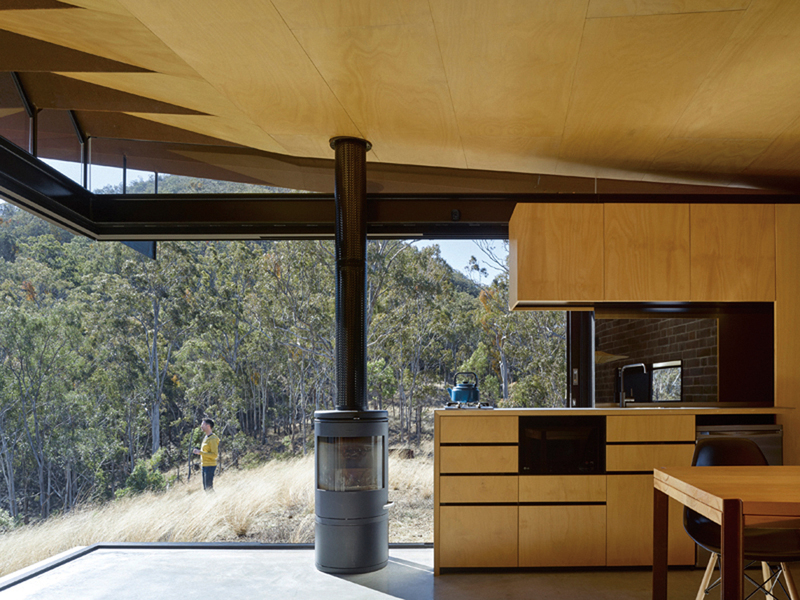 The roof corrugations give structural capacity for a single span with unsupported cantilevered eaves, eliminating conventional combustible timber rafters. 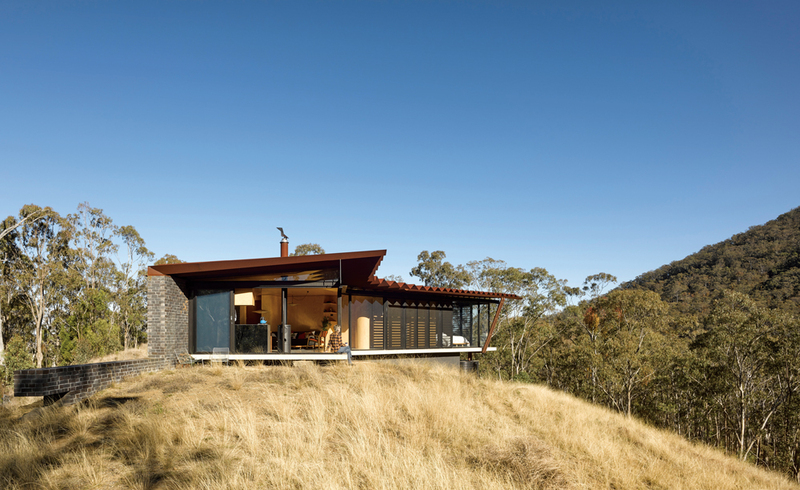 On approach, Bellbird Retreat appears fortress like with the steel roof crowning three pivoting brick blades. 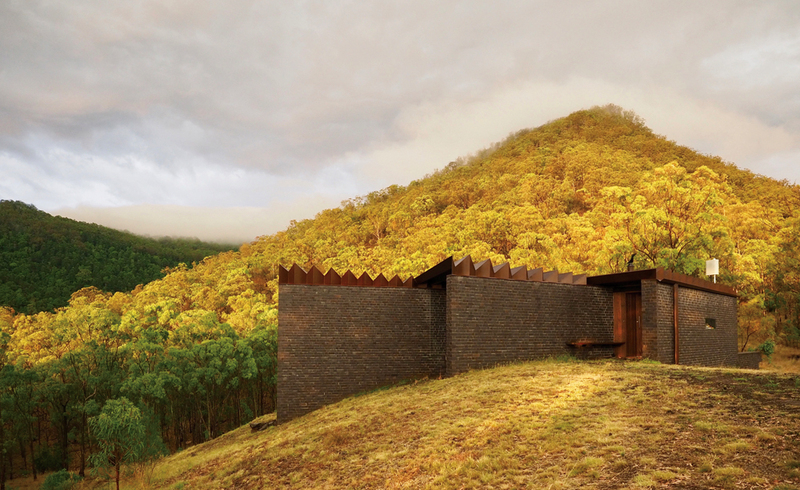 The external colour palette is connected to the landscape, mirroring earthy tones, and the bark of surrounding gum trees. 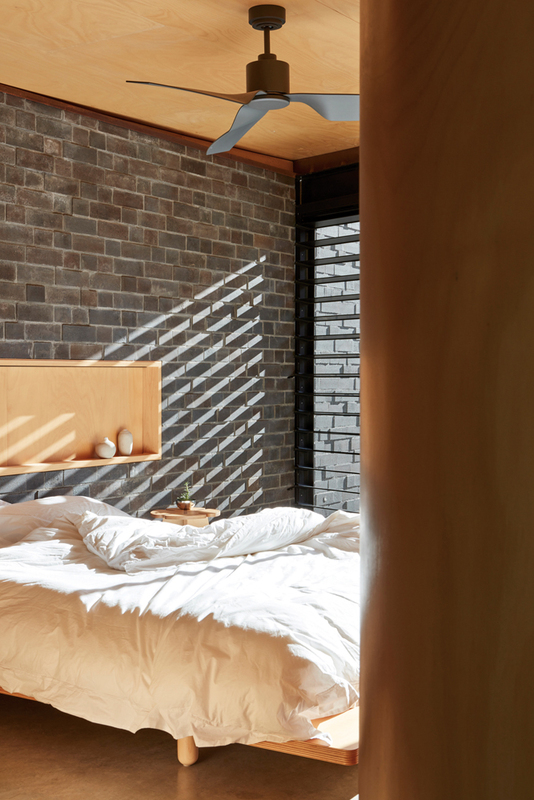 Austere blade walls featuring a pixelated textural brick treatment tie the dwelling seamlessly to the site while sheltering the building from wind, sun and fire. The twisted roof form responds to topographical site features rising up over living spaces to the near mountain top and tipping down to shelter and reduce heat to bedrooms. 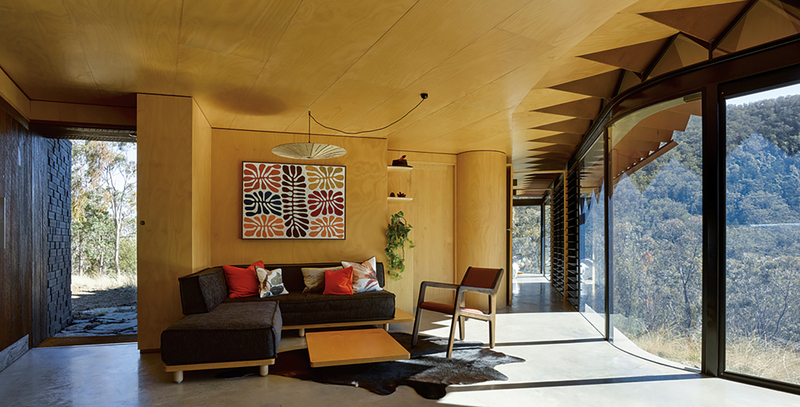 The sharp and dramatic lines and colours of the outside give way to softer finishes inside. Architectural design extends beyond the fixtures and fittings within to include personal items filling the home. “It was wonderful that the clients gave us the opportunity and commissioned us to design all the furniture and fittings to complement their rural oasis. 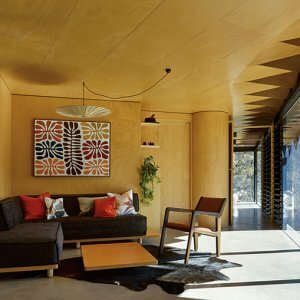 A sort of turnkey art piece you can live in they describe it as,” Steendyk said. 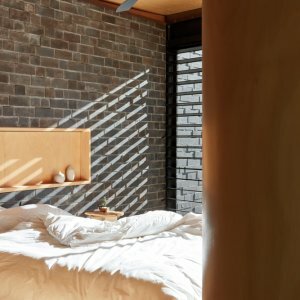 Curved walls are clad in soothing honey coloured timber in contrast to the strong angles and finishes of the exterior. Along one entire side of the house, banks of floor to ceiling glass feature, lined with thick black casings. Framing the landscape, the effect creates a living art gallery, with the rugged landscape beyond the glass providing an everchanging exhibition. Triangles of the roof sheeting penetrate through the glass line and dissolve the distinction between interior and exterior. Readers also enjoyed our story Fernside Homestead.